LA Splash's Ghoulish has been on my mind for a long, long time. After falling in love with Cashmere by Lime Crime but then learning about all the scandal surrounding the brand, I wanted to steer clear of Lime Crime but still have a colour as gorgeous as Cashmere. 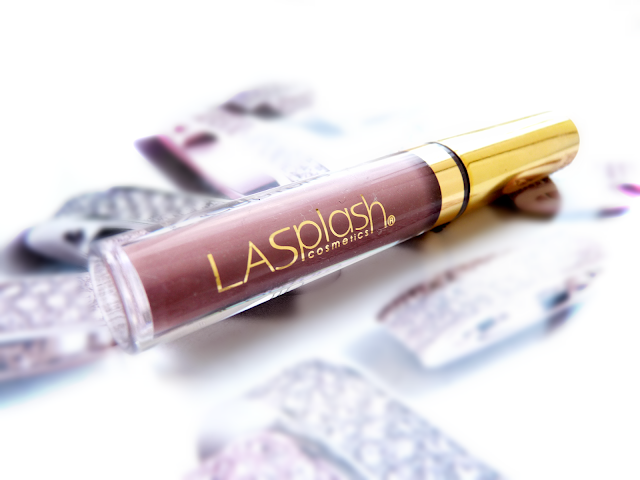 I discovered that Ghoulish by LA Splash was a dupe and from that moment on I became fixated with it. Unfortunately LA Splash isn't available in the UK which seriously tormented me; one night I even had a dream that they starting selling them in Superdrug and I woke up so disappointed. So, you can imagine my utter excitement when I saw another blogger on Twitter post a link to a website to buy these liquid lipsticks. Instantly I bought Ghoulish without even thinking twice; I'd been after it for so long, there was no way I was going to give it the chance to slip through my fingers. After ordering it in the time while I was waiting for it to arrive, I decided to read and watch a million and one videos on reviews and swatches of Ghoulish. One thing I noticed was that the shade actually looked somewhat different on different skin tones, which I thought was interesting and I couldn't wait to see for myself how it would look. I did see a few reviews saying that the product was too drying, which did worry me a bit because my lips are fairly dry anyways but I tried to stay positive because even if it wasn't as good as I'd of hoped, I had to try it for myself. On arrival of the liquid lipstick, I was so excited, I put it on straight away and literally fell in love. As expected, the colour was different on me to some swatches I'd seen, but I am still head over heels in love with the shade. It's a beautiful grey purple colour and it's so unique in comparison to any lip shade I've ever tried, I just love it so much. This is also the first liquid lipstick I've ever tried and I've heard so much about them I was excited to finally try one for myself. It's so annoying that the Anastasia Beverly Hills, Jeffree Star and Kat Von D liquid lipsticks aren't easy to get hold of in the UK because they all look so, so amazing. When applied Ghoulish is quite sticky and liquidy - sort of like a lipgloss - and it quickly (but not too quickly) dries into a velvety matte finish. I adore the finish of Ghoulish and although it is unmistakably matte and does settle slightly into my fine lines, I don't find it too drying or uncomfortable and it doesn't cause my lips to crack. Best of all, there is zero transfer when I wear this shade. I can give James a big kiss and absolutely no product transfers, but this liquid lipstick does claim to be waterproof which I found untrue because it did slightly wear and fade when I'd have a drink, but in the words of Hannah Montana, nobody's perfect and its good qualities seriously make up for anything it lacks. The stunning unique colour of Ghoulish is a definite must have for anyone looking for a unique lip shade that is still completely wearable for every day, and I am so, so grateful to have it in my life when I literally thought it would never be possible #firstworldproblems . I am loving matte liquid lipsticks lately, this one sounds fab. I wish we could get our hands on some of the american brands too!